All transactions are safe and secure with a reliable history in online purchasing behind each of our associates. Buy the Boondock Saints St. Patrick's Day Hoodie t-shirt to own Boondock Saints clothing and merchandise. How would you feel if three Russian mobsters tried to take over your local pub on St. Patrick's Day? That's what happens to Connor and Murphy, who end up in a bar fight with the Russians, giving them a sound beating. This St. Patrick's Day Boondock Saints Hoodie reflects the violent ways of the MacManus brothers. 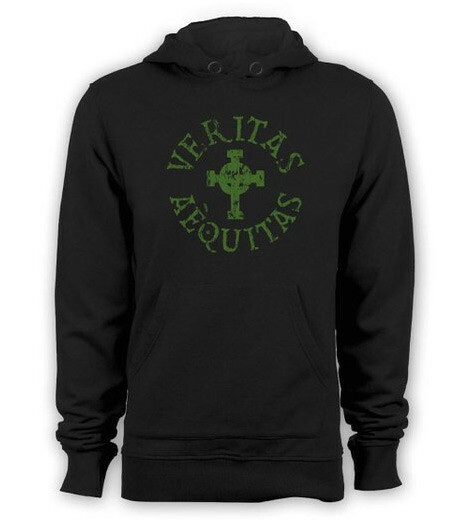 The design features their rosary cross on the front of the t-shirt, with the words "Veritas Aequitas" surrounding it. Wear this Boondock Saints costume tee as part of your St. Patrick's Day outfit. In addition to the Boondock Saints St. Patrick's Day Hoodie tee above, browse the Boondock Saints Clothing Gallery for more apparel like men's and women's clothes, kids shirts or hoodies.